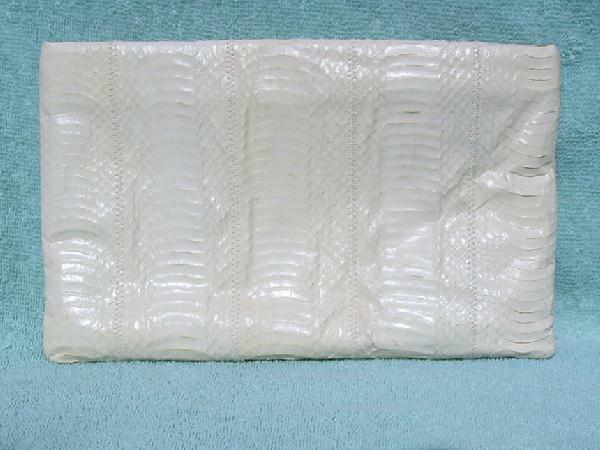 This vintage creamy bone python clutch has a hint of yellow. It zips at the top and has a leather pull. There are some gray areas by the chain holder (there is no shoulder chain) as a result of its age and the process of oxidation. The inside is lined with a soft color-matching leather (interior tag says genuine leather) and has an interior zipper compartment that is also lined in leather. You don't find linings like this any more unless it's in an extremely expensive purse. This is a great purse.